If you sustain a personal injury in a collision, or a loved one dies as a result of another person’s negligence, David Hameroff (520-792-4700) helps you be compensated financially for the damage you suffered. A strong personal injury lawyer empowers you against the person who is responsible for the injuries. This starts with a great attorney-client relationship. In Tucson and elsewhere, big law firms that spend millions of dollars advertising will often treat you as a “case number with a dollar value”. Not me, David Hameroff. As your personal injury attorney, it is important to me to be personally invested in making the situation right, as right as can be. We live in a society where nobody cares. So you need someone who truly cares about what happens to you and your family. My legal team at Hameroff Law will give you honest and experienced answers all along the process, and will provide caring support. As personal injury attorneys, we only represent victims, not the reckless or distracted driver, the negligent company, the person who caused the damage. Please click to read our Google reviews. They show why our clients loved the respectful, compassionate and competent way we took care of them and won their case. When you trust us at Hameroff Law to handle your personal injury or wrongful death, you benefit immediately from over 25 years of experience. You will see how dedicated we are to obtaining the financial compensation you deserve for your injuries, trauma, or the wrongful death of a loved one. When we accept a case for injuries caused by a car accident, we aim at getting maximum compensation to help you recover from a devastating loss. As the medical bills start piling up, it is good to know you have a seasoned, trusted lawyer on your side. My law firm handles personal injuries such as dog bites, slip and fall, and accidents caused by distracted drivers (you know, those people who text and drive). We are easy to reach and easy to talk to. We understand what you and your family are going through. We walk the extra mile to make sure you get the care and support you need while your personal injury case is in progress and afterwards. Half of our personal injury clients have been referred to us by past clients. It says a lot about who we are. Our clients recommend us because they know our legal team can be trusted with injury claims from truck and auto accidents and other matters. Let us earn your trust. 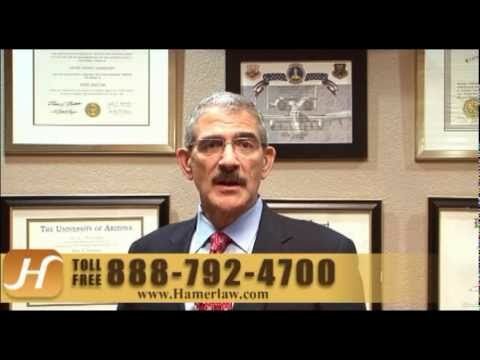 Call David Hameroff at (520) 792-4700 to discuss your case and schedule a free one-on-on consultation. My team and I are the personal injury lawyers you need to get the compensation you deserve. From our office in Tucson, we serve people throughout Southern Arizona. Call (520) 792-4700 or (888) 792-4700 today for a free personal one-on-one consultation.